The Broward County Supervisor of Elections Canvasing Board reviews ballots cast in the U.S. midterm election, in Lauderhill, Florida, Nov. 9, 2018. Florida election officials are expected to announce soon whether hotly-contested midterm election races for the U.S. Senate and governor will be subject to recounts after unofficial tallies were submitted Saturday. The contentious U.S. Senate race between Republican Governor Rick Scott and incumbent Democrat Bill Nelson has Scott ahead by about 15,000 votes, a lead of less than 0.25 percent. The governor's race between Republican former congressman Ron DeSantis and Democratic Tallahassee Mayor Andrew Gillum has DeSantis leading by almost 36,000 votes, or about 0.4 percent. Florida law requires a statewide machine recount when the margin of victory is less than 0.5 percent and a manual recount if the margin is less than 0.25 percent. Unofficial vote counts from county canvassing boards were due to be submitted by midday Saturday. The Florida Secretary of State and the Division of Elections will then determine if the returns meet the legal thresholds requiring recounts. The possibility of recounts has deepened divisions among voters in a state that is likely to play a key role in the 2020 presidential election. Recounts would determine if Nelson returns to Capitol Hill or if Republicans increase their lead in the Senate. FILE - U.S. 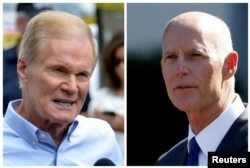 Senator Bill Nelson (L) speaks in Orlando, Florida, June 12, 2016, and Florida Governor Rick Scott appears in Washington, D.C., Sept. 29, 2017, respectively. The contentious U.S. Senate race between is still too close to call. The fight for Nelson's seat has been particularly acrimonious, with both sides filing lawsuits. Scott, President Donald Trump and other Republicans have accused Nelson of trying to steal the election, while Nelson has alleged Scott is trying to stop officials from counting every ballot. Trump called the situation "a disgrace." Scott has asked the Florida Department of Law Enforcement to investigate the election departments in South Florida's Democratic-leaning Broward and Palm Beach counties after his lead narrowed as ballots continued to be counted throughout the week. A state election spokeswoman said Friday, however, an investigation would not be launched because there was no evidence of fraud. Judges ruled in favor of Scott late Friday, ordering election supervisors in the two counties to release information on the ballot-counting. Gillum conceded defeat Tuesday night but later said every vote should count after the results began to narrow. DeSantis has proceeded as if he is the victor, appointing a transition team in preparation for taking office in January.